The Council of Scientific & Industrial Research (CSIR) and the University Grants Commission (UGC) Council Joint CSIR UGC NET university lecturer appointment and grant Junior Research Fellowship (JRF) in Science. The test is held twice a year in the month of June and December in 6 subjects across various centers in the country. 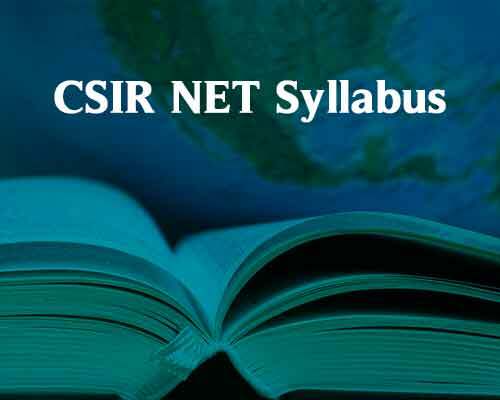 Joint CSIR UGC NET will include three papers by objective type multiple-choice questions (MCQ). Although the paper is common to all subjects, and includes 20 issues of general ability; papers B and C are the subject of relevant traditional multiple-choice questions, in which the paper C will have to analyze problems with higher value, which can be knowledge of scientific concepts and / or application of the test candidates. For every wrong answer, 1/4 mark will be deducted. Interest MC2 Academy Pune provide you with life science syllabus and preparation CSIR NET examination aspirants in classes. Candidates can prepare for this exam syllabus and better. Note: From December 2012, the sixth paper engineering sciences including engineering graduates to Ph.D. / special lectures. This file is common who have completed BE / BTech or engineering (for SC / ST / PH / VH 50%), the equivalent of all engineering disciplines and the minimum 50% of the mark. A. Atomic structure. Molecules and chemical bonds. B Composition, structure and function of biological molecules (carbohydrates .lipids.proteins. Nucleic acids and vitamins). C. Stabilizing interactions (van der Waals, electrostatic, hydrogen bonding, hydrophobic interactions, etc.). D. Principle Biophysical Chemistry (pH value of the buffer, reaction kinetics, thermodynamics, colligative properties). E. Bioenergetics, glycolysis, oxidative phosphorylation, the coupling reaction. Group transfer, bio-energy converters.